Our low rise polyamide thermally broken commercial screening, can produce high performance single storey window walling up to 3 metres high. Our system consist of a suite of profiles, and can be integrated with other products from our range to create the option for openers, giving architects the opportunity to create stunning enveloping vertical glass walls. It is one of the best performing fully thermally broken commercial systems in the UK. This is a structurally self supporting low rise window walling system that is versatile and economical. Suitable for all types of ground floor treatment where enhanced thermal performance is required. White as standard, but available silver anodised or in over 200 different RAL colours. Colours can be provided to individual taste or to suit corporate or brand requirements. Can accommodate a wide range of our windows and entrance doors. Slim-lines allow for maximum glass area and maximum light. High Weather performance, tested in accordance with British Standards. Can comply with Doc. L for thermal transmittance, with U-values as low as 1.4 W/M²K. Triple glazing is required to achieve lowest possible U values. 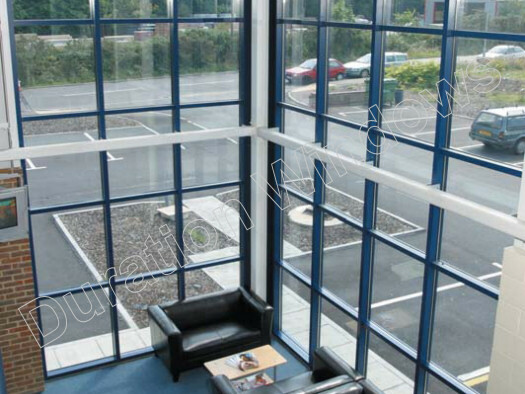 We do not supply triple glazing for our Commercial Systems.